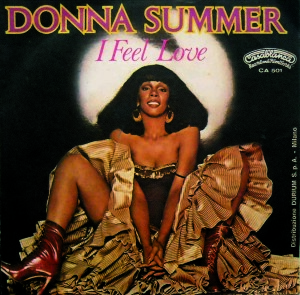 "I Feel Love" is the famous disco classic by Donna Summer, produced by Giorgio Moroder. In 2013, Beck took to turning his own song "Think I'm In Love" into a sort of medley on stage, where he ended it singing "I Feel Love." Beyond the similarity of titles, the two songs melt together quite well! Beck continued to do this throughout his Morning Phase tour of 2014, and in the post-Phase tours of 2015-2016 as well.